The heart of the Champagne region lies 90 miles (145km) northeast of Paris near the Belgian border. It is generally divided into three parts – the Montagne de Reims, the Vallée de la Marne and the Côte des Blancs. The Aube, 70 miles to the southeast, is important for wines they produce that go into many of the nonvintage blends of the major champagne houses. Of the regions 75,000 acres of vineyards, most and the greatest vineyards of Champagne, are planted in the département of the Marne. The vineyards are not owned by great landowners but by thousands of growers, often working part-time. All of the vineyards are situated on deep chalk soils. Champagne is situated on the same great basin that also forms the famous white cliffs of Dover in southern England. The chalk, a natural moisture regulator, provides good drainage (chalk can absorb up to 40% of its volume in water) and reflects precious sunlight and its heat. The thin layer of arable topsoil constantly needs a top dressing of fertilizer to do its job. Laws dictate which of the three permitted grapes may be planted where. Trial and error over time has shown the wine growers the grape types best suited for each zone of production. In a region where the annual temperature is just slightly above the minimum temperature required to ripen grapes — 50°F(10°C) — slight variations of slope and aspect are crucial. Most of the best vineyards are planted on slopes at an altitude high enough to be clear of frost (usually above 300ft or 90m), but low enough (below 690ft or 210m) to be sheltered from extreme weather conditions. Lying on a deep bed of crustaceous chalk beneath a thin layer of topsoil, the slopes of the Montagne de Reims and the Côte des Blancs provide the best vineyards. The greatest concentration of villages designated as Grand and Premier Cru are found in these two areas. The Montagne de Reims is planted mainly with Pinot Noir. Although it contains the northernmost vineyards – some even north-facing – its peculiar microclimate is well suited for the growing of the Pinot Noir grape. The Montagne is a forested plateau south of Reims. 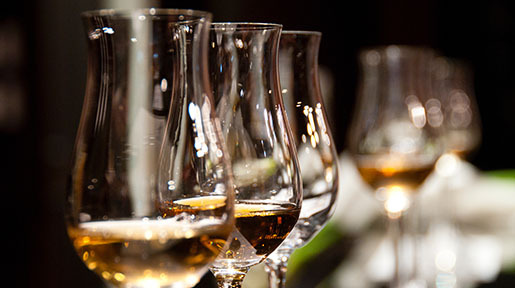 Its wines give the great champagnes their backbone – their weight and richness. Along both banks of the River Marne, is the Vallée de la Marne. 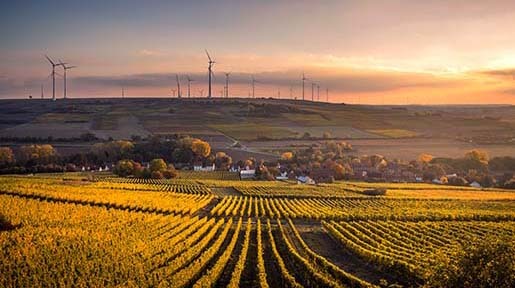 With mostly south-facing, lower-lying vineyards, this zone produces the fullest, ripest wines, predominately from the Pinot Meunier and to a lesser extent the Pinot Noir grapes. Some Chardonnay is beginning to make inroads into the area. Extending south from Epernay for about 13 miles (21km) is the Côte des Blancs. The ridge is planted on both slopes, but the best vineyards are on the eastern side. The chalk subsoil combined with its relative warmth, produces the fine Chardonnay that give freshness to the blend and encourages the sparkle. The Aube is Champagne's most southerly zone. Located about 65 miles (112km) south of Epernay, its climate has more extremes in temperature and the grapes achieve greater ripeness. Though rarely talked about, its wines are an important component of the nonvintage wines of the big houses. A newcomer to Champagne is Côte de Sézanne. Planted in the 1960's almost exclusively with Chardonnay, its southern location means that its grapes ripen better than most of the other zones. The classification system in Champagne is based on vineyards and is established by the Comité Interprofessional du Vin de Champagne (C.I.V.C.). The land is given a grade based on its suitablilty for growing white grapes or black grapes. 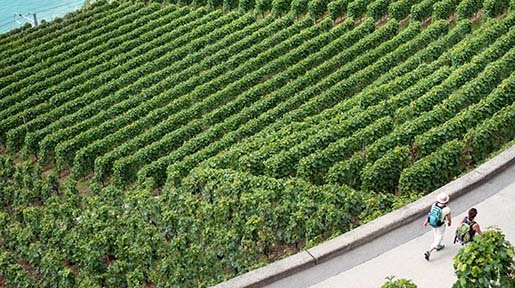 A grade of 100% percent has been given to the 17 Grand Cru villages. The 38 Premier Cru villages have grades from 90 to 99%. The rest have a grade ranging from 80 to 89%. Champagne houses use the average percentage rating of the grapes used in their blends to establish the quality of their raw materials. The price a grower gets for his grapes is also determined by this percentage system. A grower with a 100% vineyard may ask the full price while the others would get a percentage based on the 100% price. The restrained richness of champagne wines owes a lot to the cold climate of northern France. Over time the region's wine makers have created their own techniques to overcome the cold winters and short growing seasons. The fact that the grapes ripen very slowly has its benefit too, as the grapes have time to pick up important favouring components. But when the grapes are harvested, they are rarely ripe enough to make table wine without the addition of inordinate amounts of sugar. The producers have gotten around this by making a wine low in alcohol and then putting it through a second bottle fermentation to raise the alcohol and add the bubbles. The bubbles in champagne are a natural phenomenon that is today a managed affair. The second fermentation in the bottle causes the bubbles. When the cork is removed, the result is upwardly mobile bubbles of carbon dioxide making their escape. 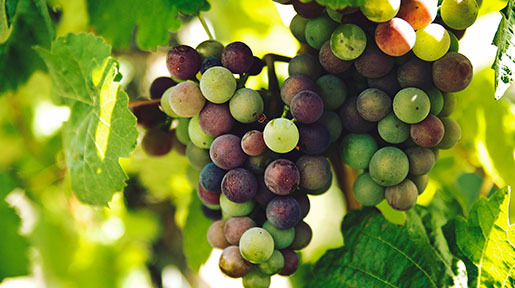 Three grape varieties are used in Champagne — Pinot Meunier, Pinot Noir and Chardonnay. Pinot Meunier dominates the vineyards, growing on about 40% of the total acreage It is easier to grow and is less prone to frost damage. This grape makes up the base wine for all but the very finest champagnes and is grown only in Champagne. Pinot Noir is second with about 35%. It is responsible for the depth of fruit and longevity of the wine. 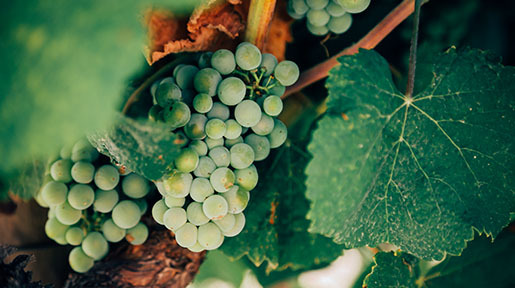 Chardonnay accounts for the remaining 25% and adds lightness, elegance and breeding to the blend. The lack color in most champagne is the result of a gentle pressing, so as to extract the juice but not the color of the black grape skins. The chief difference between the various Champagne brands or houses, is in the making of the cuvéee, or the blend, as introduced by Dom Pérignon. A house builds a reputation based on the particular style of blend of its non-vintage wines. So each year the wine must be consistent. The large houses store millions of gallons of wine from various vineyards and grapes for blending purposes. It is reasonable to assume that once you find a house style you like, it will be available year after year as long as that house exists. The theory of producing a great champagne is to blend together the best qualities from each of the best grapes grown in the region. The blending of the still wines before the second fermentation called the assemblage and the wine and sugar that is added after the second fermentation and aging called the dosage, are the two most important steps in the determination of the house style. In especially good years, some vintage champagne is produced. Some feel that the extra depth in taste is well worth the extra cost of these wines. Eighty percent of the contents of vintage champagne must contain grapes from the declared year. Not all of the grapes from a declared year go into vintage champagne. Twenty percent are held back to be used for blending purposes. Extra Brut, Brut Sauvage, Ultra Brut, Brut Intégral or Brut Zéro — These wines are bone dry with less than .6% of residual sugar per liter. In this case the dosage is of the same wine and not the usual solution of cane sugar and still wine. This wine is rarely made. Brut — This is the most popular style of champagne. The best blends are always reserved for the brut and is the mainstay of the business. It has less than 1.5% residual sugar and is very dry. Extra Dry, Extra Sec — Sweetened with 1.2 to 2% residual sugar per liter, it is dry. It goes well with desserts and wedding cakes. Sec — Although it means "dry" in French, it means "moderately dry" or "slightly sweet" as it pertains to champagne. It has 1.7 to 3.5% residual sugar per liter. Demi-Sec — This style is distinctly sweet or medium sweet and is rarely seen in the United States. It contains between 3.3 to 5% residual sugar per liter. Doux — This is the sweetest style of champagne. It is very sweet and is more of a dessert-style wine. It has a minimum of 5% residual sugar per liter. Occasionally you will find Blanc de Noirs. This style is made entirely from black grapes but is white. It offers a wine that is fuller than those with Chardonnay in the blend. More often you will encounter a Blanc de Blancs. This wine is made exclusively from the Chardonnay grape and is the most delicate of champagnes. As only 25% of Champagne is planted with Chardonnay, it is generally a more expensive option.